Midori - Cottage Farm Inc.
Midori , or Dori as we called her was born in spring of 2009. 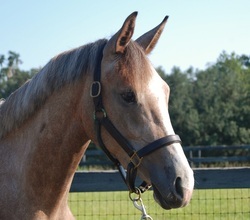 She attended her foal inspection at Pennock Point , Reddick, FL in the fall of that year scoring 8.0,8.0 7.9. We were thrilled when Dori was sold to a young rider on the USEF Developing Riders list in 2011 and looked forward to seeing her blossom in the eventing field with her talented owner. In 2012 Midori became ill and her young owner had to make the heart wrenching decision to let her go over the rainbow bridge. RIP little girl!